NCHN 2012 Leadership Summit, Do Your Best & Link to the Rest, started with a flying pig, crayons and blank paper for drawing and a lot of laughter! Nineteen network leaders and staff, representing sixteen networks and twelve states; along with five speakers, and your NCHN Executive Director came together for a day and half of learning, sharing, and fun. The event started with participants drawing a pig, while a flying pig flew around the room. Thanks to Darcy Czarnik Laurin, Thumb Rural Health Network, MI, Summit participants learned all about themselves through the “Network Leader Pig Personality Profile” exercise. 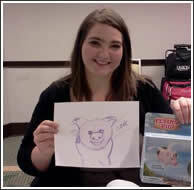 Kim Buckman (pictured above), Project Director, Northeast Missouri Mental Health Transformational Network, received the most votes for her pig drawing and was so excited to win the flying pig! Stacie Pace, Director/CEO, Southeast Oklahoma Rural Health Network won second place in the pig drawing and received a Halloween package. Heman Marshall (pictured right), III, Principal, Woods Rogers, PLC, Roanoke, Virginia, discussed the Affordable Care Act and what it means to healthcare providers, including specific areas that networks should consider assisting their members prepare for the various provisions and implementation of the act. 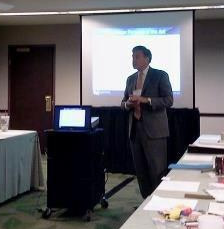 Heman’s presentation was followed by a roundtable discussion in which participants shared best practices of board leadership training they had conducted with their own board members. The afternoon was devoted to “Facilitation for Innovation and Collaboration in Networks,” led by Dr. Mary Kay Chess, Faculty, Bainbridge Graduate Institute in the NW and at Saybrook University, Pacific Northwest. Numerous comments on the evaluation praised Mary Kay's session as an excellent tool for facilitation. The day ended with a session on “Branding for Success” given by Randy Jacobs, President, TAG Healthcare Marketing, Davenport, Iowa. Wednesday morning, September 26, Steve Roling, CEO, Health Care Foundation of Greater Kansas City and Dr. Bill Moore, Vice-President, Program, Policy and Evaluation of the REACH Healthcare Foundation discussed their foundations’ work. They also shared with participants an overview of the types of healthcare foundations and offered suggestions on how to approach and work with foundations in their local communities and states. Participants identified several items from the Leadership Summit experience on the evaluation that they plan to share with their network members and staff. Members of the 2011 Transformer Leadership Learning Community that attended the Summit will continue to meet as a community throughout the next six months and will come together with the new 2012 NCHN Leadership Learning Community, which will also be meeting via conference calls with Dr. Chess, at the 2013 NCHN Annual Educational Conference in New Orleans, Louisiana. Each participant at the Leadership Summit received a copy of the “2012-2013 NCHN Network Leadership and Development Workbook,” which they will be utilizing on the calls with Dr. Chess. If you are interested in the NCHN Leadership Learning Communities and/or would like more information about the next Leadership Learning Community opportunity, please contact Rebecca. September 24, 2012 (Kansas Health Institute) - Practicing medicine on the frontier in Kansas doesn't have a whole lot in common with big city medicine — so why would small town hospitals use big city physician recruiters? Kiley Floyd said it's clear to her now that they shouldn't, but the chief executive of Osborne County Memorial Hospital learned the hard way. "Small rural hospitals are not the same as large tertiary hospitals. Requirements of docs are different, the relationship with staff is different, the patients are different. When you're using a large recruiting firm, I learned the hard way that they don't get that. They're in it to make money," Floyd said. "We needed a good match." September 26, 2012 (Rural Health Voices) - Supplemental payments for Medicare-dependent hospitals will expire Oct. 1, but NRHA’s Maggie Elehwany told HealthLeaders Media she’s hopeful Congress will pass the bill to renew funding for Medicare-dependent and low-volume hospitals for another year. The webinar will address the complex relationships of co-management through a discussion of co-management from a key stakeholder approach. September 26, 2012 (HealthIT Buzz Blog) - An accident happens on a farm and a man is taken to the nearest hospital, a tiny Critical Access Hospital, the only urgent care facility in the area, an hour drive over unpaved roads from any other hospital. The medical team stabilizes the patient and then sends him by helicopter to the nearest tertiary care hospital. What if the Critical Access Hospital could electronically transmit the patient’s medical record, including his lab and imaging results, to the tertiary care hospital while the patient is still in flight? If the hospital is able to electronically transmit these records, the doctor could review her patients’ records and get a head start on saving his life before he is even wheeled through the hospital’s doors. September 27, 2012 (HHS News Release) - Health and Human Services (HHS) Secretary Kathleen Sebelius today announced new grants that will improve the quality of care at community health centers and ensure more women are screened for cervical cancer. The grants will help 810 community health centers become patient-centered medical homes (PCMHs) and increase their rates of cervical cancer screening. September 27, 2012 (ehrintelligence.com) - Critical access hospitals (CAHs) play a pivotal role in providing healthcare to rural and remote communities and their proficiency in health information technology (IT) is crucial to their communities during emergencies, according to a recent piece on Health IT Buzz. Yesterday, Mat Kendall, the Director of the Office of Provider and Adoption Support in the Office of the National Coordinator for Health IT (ONC), and Leila Samy, Rural Health IT Coordinator, highlighted the challenges CAHs face not only in extending their patients’ access to high-quality healthcare but also achieving meaningful use. “With the right technology, including electronic health records (EHRs), this hospital can keep its patients in their own community and close to their families,” wrote the authors. September 23, 2012 (Wisconsin State Journal) - Six medical facilities in rural Wisconsin are looking at starting or expanding training programs for medical school graduates, which could ease a rural doctor shortage expected to grow in coming years. "Physicians who spend a significant portion of their training time in rural areas are much more likely to practice rural," said Wilda Nilsestuen, coordinator of the Wisconsin Rural Physicians Residency Assistance Program, based at the UW Department of Family Medicine. September 24, 2012 (InformationWeek Healthcare) - It's hard to imagine a successful accountable care organization (ACO) that doesn't rely heavily on IT. ACOs require that clinicians meet a long list of quality measures to prove that they're acting in an accountable way to reduce costs without reducing the quality of medical services. And most of those metrics are best tracked with software. September 2012 (Flex Monitoring Team via Wisconsin Office of Rural Health) - This Briefing Paper presents state and national median values of the twenty financial indicators included in the CAH Financial Indicators Report, a report that is distributed to each CAH administrator annually. As part of ongoing work of the Flex Monitoring Team, these indicators were specifically designed to capture the financial performance of CAHs. Twenty-one indicators fall under six domains: profitability, liquidity, capital structure, revenue, cost, and utilization. In the pages that follow, a brief description of the domains and the indicators within them is provided, along with a table that allows comparison across states. September 21, 2012 (HealthIT.gov email) -You spoke, and we listened. This week we launched some new features and resources to make healthit.gov easier to navigate. We want to thank you for your support and feedback. Federal Advisory Committees (FACAs): Meeting materials and a recording of the Health IT Standards Committee meeting held Wednesday, Sept. 19, are now available at http://www.healthit.gov/policy-researchers-implementers/hit-standards-committee-1. Visit our FACAs page to stay abreast with FACAs meeting dates and news. We have updated the calendar to combine both Health IT Policy and Standards committees and workgroups meeting dates based on your feedback and suggestions. You can more quickly select meetings from the FACAs Calendar and access meeting materials. National Learning Consortium: The National Learning Consortium (NLC), in partnership with HealthIT.gov, regularly publishes information and resources from the field from ONC's grant programs to help providers and professionals throughout the EHR implementation lifecycle and to achieve meaningful use. See the recently published Meaningful Use Case Studies, which detail the experiences of providers across the country on their journeys to achieve meaningful use. Each case study focuses on a subset of the Stage 1 Meaningful Use requirements and includes key challenges and lessons learned. They also highlight collaborations with the Regional Extension Centers. To view other NLC resources, visit the EHR implementation lifecycle steps. Standards Hub: To make it easier for the public and EHR technology developers to find and access all of the standards referenced by the 2014 Edition EHR certification criteria, ONC has now made available a new resource, “the Standards Hub.” The Standards Hub identifies and provides hyperlinks to all of the standards referenced by the certification criteria adopted in the 2014 Edition Standards and Certification Criteria final rule. The Standards Hub can be accessed at http://www.healthit.gov/policy-researchers-implementers/meaningful-use-stage-2-0/standards-hub. For more information on the 2014 Edition EHR Certification criteria, visit http://www.healthit.gov/policy-researchers-implementers/meaningful-use-stage-2-0. The Office of Minority Health and the Delta Regional Authority are collaborating via a MOU, to provide interest free micro loans up to $7,500 to assist eligible healthcare providers in the purchase and installation of electronic medical records systems. Eligibility for this program is only open to healthcare providers within specific counties in the states of AL, AR, IL, KY, LA, MS, MO, & TN. Providers working within HRSA HPSA areas, or medically underserved areas will be eligible to apply for the funding. Additionally, technical assistance will be provided to all awardees to train personnel and trouble shoot problems with their new EMR systems.